Americans do like to celebrate Independence Day with a spectacular fireworks display, but a test flight of an intercontinental ballistic missile (ICBM) is a bit more than we usually expect. But that’s the surprise Kim Jong Un claimed he had for us this Fourth of July, and it is a worrisome one. North Korea’s news agency, KCNA, has released a video of the launch, and asserted a maximum altitude of 2,802 kilometers before impacting in the sea 933 km downrange and 39 minutes later. The governments of the United States, South Korea and Japan have made statements confirming the launch and approximate level of performance. If true, this is a successful demonstration of a missile with intercontinental range, possibly one capable of reaching targets in the continental United States. We hadn’t expected this to happen this soon. However, it will probably require another year or two of development before this missile can reliably and accurately hit high-value continental US targets, particularly if fired under wartime conditions. For now, it is a more uncertain threat. But an uncertain threat to the US mainland can still be a powerful deterrent, and it probably won’t take years for us to see the diplomatic and political implications of that threat. Interestingly, the Russian defense ministry claims that the maximum altitude was only 510 km. The first report from the US Pacific Command claimed that the apogee was at least 2,500 km, but called the missile an intermediate-range ballistic missile (IRBM) even though a 2,500 km apogee would give a range well beyond the 5,500 km threshold for an ICBM. These inconsistencies should serve as a reminder that these are all preliminary reports of a very recent event. Whose figures are most accurate, we don’t know. Nothing can yet be said with certainty, and some of what we are being told may be quite wrong. But, acknowledging that uncertainty, we will at least tentatively assume that the claims of a 2,500+ km apogee and 37+ minute flight time are accurate. As with most of North Korea’s recent long-range missile tests, this one used a so-called “lofted” trajectory to keep the missile from overflying neighboring countries while still demonstrating high performance. If the data is correct, preliminary trajectory reconstructions indicate that if the missile were fired on a more efficient trajectory it would reach a range of anywhere from 6,700 to 8,000 km. David Wright, who provided the 6,700 km figure, acknowledges that his early analysis did not include the effect of the Earth’s rotation and the performance would probably be higher if the missile were launched in an easterly direction. The United States, of course, is to the east of North Korea. By any standard, this is the performance of an intercontinental ballistic missile. Fired from North Korea, it probably couldn’t reach the contiguous United States, but Hawaii and Alaska would be within reach. 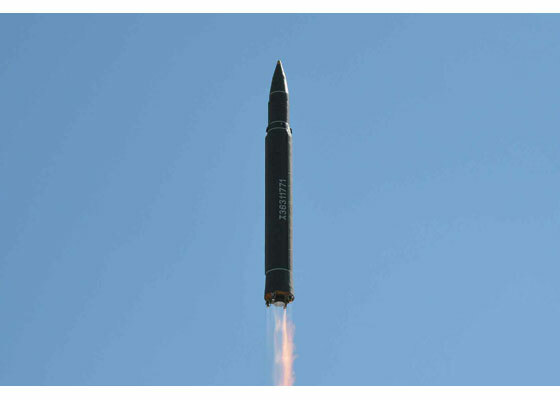 The missile, which North Korea calls the Hwasong-14, is very similar to a liquid-fueled missile first displayed on parade in late 2015 and later identified as the KN-14. One key difference is that the KN-14 used a dual first stage engine, while the missile just tested used a single main engine with four smaller verniers for control. The dual-engine configuration was probably never more than an interim design, depending on a limited supply of Cold War surplus Russian hardware. The new single engine is very similar to one used in last month’s test of the Hwasong-12 (a.k.a. KN-17), and is likely a new North Korean design. Indeed, given the timing, it looks very much like the Hwasong-12 was being used to develop and test key technologies for the Hwasong-14, minimizing the chance of a politically embarrassing failure in the first flight of a North Korean ICBM. Another key difference is that the upper stage and particularly the reentry vehicle have been reshaped. The original blunt reentry vehicle of the KN-14 has either been redesigned, or enclosed in a hollow payload fairing. A payload fairing would modestly improve the aerodynamics of the missile in early flight, giving a small increase in performance. Payload fairings on ICBMs are also used to cover multiple warheads and/or decoys and other penetration aids, but this missile does not have the performance to carry multiple warheads or more than a very minimal set of decoys. Finally, while the Hwasong-14 appears to be carried by the same transporter used to parade the KN-14 through the streets of Pyongyang, it isn’t being used to launch the missile. Instead, the transporter simply erects the missile on a small, expendable launch stand, and drives away to a discrete distance. This will slow down launch operations to some degree, but greatly reduces the probability of an expensive and possibly irreplaceable missile transporter being destroyed in a failed test. North Korea may retain the ability to launch directly from the transporter in wartime operations. Even if they don’t, the missile is still at least somewhat mobile and so difficult to destroy in a preemptive strike. It is probably reasonable to consider this missile a variant of the previously-displayed KN-14, rather than an entirely new missile. At a minimum, it is part of a common family with the KN-14 and KN-17. We can speculate on whether this test was successful or partially successful. It was probably at least partially successful. But we don’t know whether the North Koreans were hoping to reach a greater range. If their propaganda threats reflect their targeting plan, then they still can’t reach places like the US naval base in San Diego and certainly can’t come anywhere near the East Coast of the United States—at least not with this missile in its current form. If it was only partially successful, that may mean the North Koreans have other homework to do, particularly if the missile didn’t reach its expected degree of accuracy. A missile needs to shut down its engine in a precisely-controlled fashion to hit even as large a target as a naval base or a city, and that needs to be tested. If instead the missile runs out of fuel even a few seconds early, another test is required. Irregular performance of the heat shield on the reentry vehicle is also common in early ICBM testing; it is rare for the warhead to actually burn up, but common for it to be thrown far off course. It will probably require additional testing to correct for that. If, in addition to a warhead, North Korea hopes to include even a minimal system of decoys and penetration aids, those will likely need a very extensive test program and may not be available in the first operational version of the missile. Finally, a single test cannot demonstrate a missile’s reliability. And it isn’t just the missile’s reliability that needs to be demonstrated. The launch crews will need to demonstrate that they can reliably launch the missile on short notice, under combat conditions and possibly with US or South Korean missiles already on the way. They will need to train and practice operating the missile’s transporter and associated support systems at remote sites and conduct very hazardous propellant loading operations without the facilities of a missile test range. Having done this with some degree of success, once, under ideal conditions, doesn’t mean they can do it in the middle of a war tomorrow. A key issue that is still unclear is what level of reliability North Korea aims to achieve. For instance, if it were to try and launch a Hwasong-14 in combat later this year, there’s a better than even chance that it wouldn’t work even though the same design worked well enough under the ideal conditions of a test launch. The missile could simply fail to launch, might possibly explode or could just fly far off course and hit nothing of importance. But it could also work well enough to destroy a city—and with enough mobility that nobody could be confident of destroying it before launch. However, if North Korea’s immediate goal is deterrence, then that may be good enough. But it probably won’t take them more than a year or two to learn how to operate this missile reliably and accurately in combat, and to incorporate whatever design modifications or performance enhancements this test may call for. 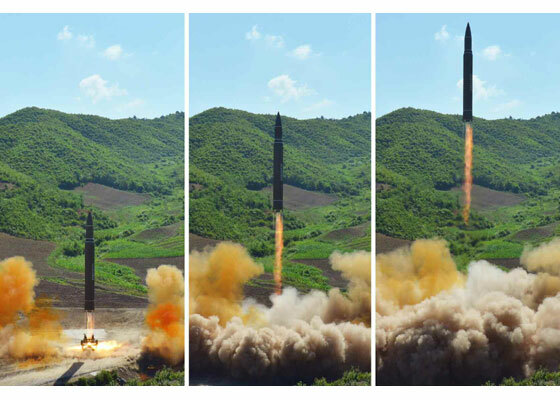 We had thought that we would have until perhaps early 2020 to prepare for a North Korean ICBM capability, but it turns out they were working on a different timetable. That has serious strategic, diplomatic and political implications for the very near future. For instance, starting today, US military commanders cannot be 100 percent certain that a war on the Korean peninsula won’t stretch at least as far as Hawaii or Alaska. Soon, US allies will wonder if this is going to affect US commitments to defense and stability in the region. And the US political leadership is going to have to figure out what to do about that.